Groß, kraft- und gehaltvoll, trocken und fest, typ- und ausdrucksstark, leichte Gebäudestreckung, kräftiger Kopf, sehr gute Oberlinie, hoher Widerrist, kräftiger Rücken, Kruppenlänge und -lage lobenswert, Vor-, Hinterhandwinkelung und Ellenbogenschluß sehr gut, sehr gut entwickelte Brustbereiche, lange Unterlinie, korrekte Front und Trittfolge, sehr harmonische, weit ausgreifende Ganganlagen, kräftiger Nachschub, freier Vortritt. Rückenverhalten sehr gut. TSB ausgeprägt, läßt ab. VI. Beratung für die Zuchtverwendung Besonders geeignet zur Verbesserung der Vorhandstruktur und der Ganganlagen. VA 1 Omen - then 2. Paer, 3. Mentos,4. Labo, 5. Enosch, 6. Etoo, 7.Chacco, 8. Fulz, 9. Ballack, 10.Leo, 11. Iliano. 12.Saabat, 13.Cobra, 14.Yankee! This was the final order!!! The list of VA is in catalognumbers order! A super new picture of a super VA male. Good luck to Ralf and Karsten for 2013 with Chacco. Congratulations Ralf, Work well done with beautiful Chacco!! Gratuliere mit Chacco VA10 bszs.2012. Super!! Gratuliere mit Chacco VA12. Super!! Super male, he will be VA this year for sure. Best wishes and congratulations to Ralf. Such a beautiful boy. My kind of GSD! I have seen some top progeny from this super male, I think a good progeny group this year for Chacco making him a strong contender for VA. These you wrote here below were my exact thoughts when I heard the starting list through the stadium's loudspeakers. He also deserved to be placed much hihger for he was the only descendant of a blood line that would have been otherwise forgotten (esko via yerom) and because, although he was too young to present a progeny group, many puppies and young dogs were already visible in shows and on this very pages through the season. I renew David's invite to use this dog: I'd probably do it myself with one of my females in the very near future. LBNL: a super charcter, that is almost lost nowadays in the show lines. Look at the tremendous impact he gets on the long attack at the Siegerschau TSB: he is a totally crazy (yet controllable) dog, like his father. Definetly lower VA or in the first two places as V.
I watch Chacco do his individual and then compete in the final ring and achieve his V11. I have to say that Chacco is an outstanding male and put in an impeccable performance at all phases of his presentation. I have no doubts in my mind that Chacco fully deserved to be placed much higher. Indeed I believe he should have been at least V2 and perhaps a low VA. His breeding, being a son of VA Yerom with his magnificent colour coming through VA Nero from his mothers sire line. I sincerely hope this male is not lost to knowledgeable and discerning GSD breeders here in Europe and the States. For such a male NOT to have maximum breeding opportunities would be a sad loss to our wonderful breeds future. It must be remembered it is the views and actions of the BREEDERS that determine which dogs are genuinely TOP CLASS. Many VA's are quite rightly largely ignored by discerning breeders. 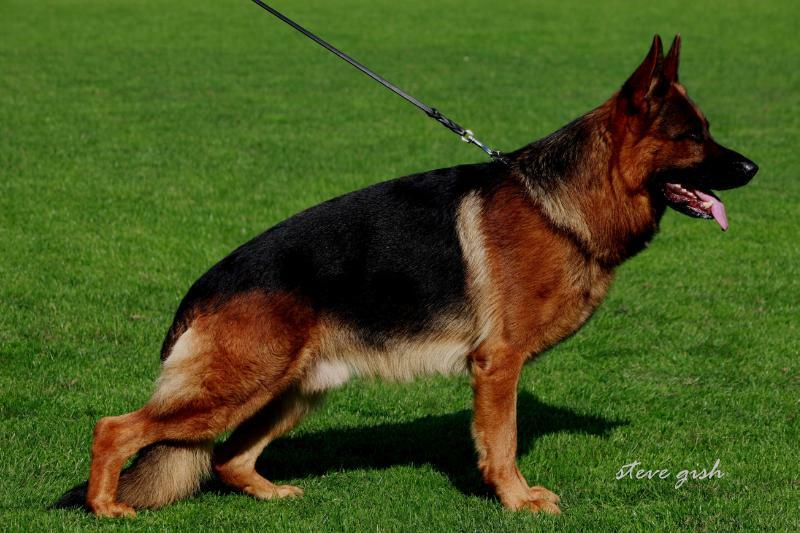 Reinhardt Meyer may have the power to decide the gradings in the Working Class, but never forget it is the discerning breeders who decide which male they will use, and THAT is the ULTIMATE POWER in our GSD breed. Congratulation Mr. Lang and Mr. Bischoff for Chacco in Nurenberg! Fantastic Bitework and powerfull running! We would like see Chacco on VA!!! V4 BSZS 2011 Etoo aus Wattenscheid there is a big gap between 4 and 11 politics or no politics. dont be jealous jerzypawlik i know you are playing a big role in selling chacco to china and you have a big commission you will get. its better if he leaves germany maybe then he wont embarrass you. chacco is a good looking male and he is really deserving of how he places, sorry but V11 is what he deserves. To me Chacco is a VA dog , super overall put togather male with excellent male characteristic and supreme progany, but the decision belong to Mr. Meyer , and i hope this time he'll get it right. he can be a top V this year. congratiolations on your VA1 on the dutch Siegerschau. good luck on the HZS!!! Congratualtions Ralf on Chacco's VA1 at the Dutch Sieger,many people said he looked super. Congratulations on Chacco making VA1 at the Dutch Sieger show today. Looking at the progeny from Chacco, you can already see a great anatomy, type and coulour coming through, taking note of one of the best producing females in Germany "Pitty". This male has a great offspring and will show this in the ring. Have seen a litter from Chacco and must say he produces very well, big boned black and red with with nice expression and this age. Very well done and congratulations. Super looking photo. Good luck with the puppies Sue they sound very interesting, looking forward to some photo's. I have 4 males and 2 females from him and Bine Gleisenauer Schloss born 7th December, lots of hopes for their future, pictures to follow as and when they grow big enough !!!!! Congratulations Ralf, Karsten and Chacco on another V1 !! Keep them coming !! Congratulations on Chacco making V1 on Saturday....Great result for a dog with a great future. Super new picture of Chacco, in this condition and hair at Siegershow he surely would of made the top 4 places..
at the Siegershow 2010, an absolutely super good looking dog. Looking forward to having his progenies. Lots of more succes with him in the future. CONGRATULATIONS Ralf ; Chacco is SUPER!! Tremendous male just look at that bone and type, WOW what a SUPER Star, another excellent Pitty progeny, congratulations on such a top producing motherline. Well done at the weekend Ralf..Super result and defenatly one to watch out for this year at the sieger show..
the winner of 2009 (SG.1)was presented in top condition.strong substantial,masculinity and dark eyes.he have bright future. I see Chacco at the show in Oppenheim judge Heinz Scheerer and he make SG1, what a super correct anatomie with super type and movement, I think he could make Sieger 2010. Heiner and Budhiman- for me the best son of Yerom. Another super dog from this top kennel. BEST SON FROM YEROM, LOOKING FOWARD SEENING HIM IN 2010.
vow vow vooow, another super dog from pitty. she's producing very well. xano and this male are really outstanding.